Alpha Rail has completed the installation of vertical bar metal railings at three separate housing developments within an area of North West London. The three garage sites, all located within the London Borough of Brent were demolished to create the space required to build 10 new low-rise residential units and infill apartments at locations that included William Dromey Court, James Stewart House and Ainsworth Close. The new properties were built over a 46-week period and estimated to cost close to £3.2m. 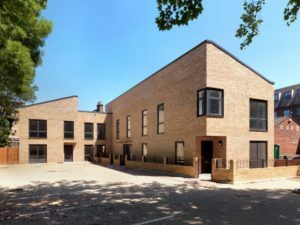 Constructed to combat a shortage of housing in London and the South East, the new homes will be made available for social housing and will provide much needed accommodation for local authorities, housing associations, residential social landlords and private developers. Thomas Sinden was appointed as the main contractor for the project, who then sub-contracted Alpha Rail to manufacture and install the vertical bar metal railings which were installed to the perimeter brick walls surrounding the entrances to the properties. In total, Alpha Rail manufactured 60 metres of various height vertical bar metal railings. To provide the most cost-effective solution, the railings were baseplated to the top of the perimeter wall. This fixing option involves using chemical anchors to fix posts directly to the top of the walls. Chemical anchor systems can often be used with sieves that improve the anchor strength in brickwork that contains voids. In addition to this, Alpha Rail also manufactured and installed 8 single leaf gates, complete with support posts that were baseplated into the ground adjacent to the brick perimeter wall to provide residents with safe and easy access in and out of the properties. All metalwork installed by Alpha Rail was hot dipped galvanised to protect against corrosion, followed by a polyester powder coat in RAL 9011 Graphite Black. To view other projects where bespoke vertical bar metal railings have featured on the other residential properties please visit our project library for more information.